3 Floyds / Surly Urine Trouble | 3 Floyds Brewing Co. Pours light orange, bright white head, finger, fluffy, lacy. Aroma was mostly all Brett, funky, wet hay, musky. Some floral hops, but the Brett was up front for sure. Tasted wasn't nearly as much Brett, But lacked some complexity. Fairly bitter, floral and piny hops with some jaunts of musk and hay. Body was oily, slick, somewhat bubbly and crisp, not too heavy though, which was good. Overall, interesting for sure. I enjoyed the Brett in the aroma, but it didn't connect as well in the taste...still a quite good beer. The price tag is a bit unfortunate for what you get though, truth be told. It didn't take long for the hoppy beer makers at Three Floyds to take on the newly developed Brett-ed IPA. However, it took the prodding along from Surly brewing to jump into this deep water and doing so in imperial fashion. Living up to its namesake, the color is deep golden and with an unhealthy copper tinge. A light froth bubbles up from the calderon and retains its heady appearance throughout the session. Sticky lacing is random and intricate. Incredibly pungent and sweaty, the nose is chocked full of citrus, dried limes, sea air, and a big ole bright bouquet of chivey herbs. Hinging on garlic and onion, a catty scent from hops wrap around the light saddle leather character from yeast. Notes of sawdust, weathered wood and cider only complement the mix. Its dry malt taste is light on sweetness and carries a straw, hay, and whole wheat type of character. Dried citrus fruits ranging from oranges to limes and tropical blends all make their way into the middle palate. Attic-like must takes over from there and introduces earthy wood rot, brine and distinctive herbs that remind me of how closely related that the hop plant is to the cannabis plant. As the beer finishes, its earthen bitterness comes at me like collared greens, fresh sawn pine and pungent cheeses. Its a complex taste but an effortless body. Its utmost dryness keeps the ale lively and light as the abundance of carbonaiton keeps the beer pushed to the roof of the mouth and adding virtually no weight to the tongue. Its fleeting finish is musty, spicy with alcohol warmth, and arid in a short-lived aftertaste. With a lot of Berlinerweiss flavor- the ale almost strikes me as an imperial stab at this style. But then we have those hops to contend with and that gets tricky. But leave it up to the madness that is Three Floyds and Surly to devise such a concoction to keep us guessing with each and every sip. Thanks to hopslam11 for sending this bottle down! Reviewed from notes. Poured from bomber into a Peg's snifter. A: Very hazy orangish-gold with a half-finger of white head and only a small amount of visible carbonation. S: Funky, barnyard and horse, wet grassy and tropical fruits with grapefruit and lemon hops as well. A light biscuit malt aroma lurks underneath. T: Follows the nose – funky grassy barnyard, then a big pineapple hit, with citrus, dankness, and more wet hay. A dry bitterness in the hang with some tart funk on the exhale. M: Medium body, carbonation sensation on the low side, and the alcohol is noticeable but seems well-integrated into the flavors. O: Wow. This was really, really tasty. While not quite the same style, I did prefer Crooked Stave's Hop Savant to this one, but I found the Urine Trouble to have a lot more pineapple and citrus flavor, rather than more dominated by hay and grass tastes. Recommended. As an aside, I didn't find any "cherry pie" flavors in the beer at all. On-tap at Northdown. Served in a tulip. A - Off-white foam settles to a solid cap, thick collar, and splotches of lacework. Hazed golden orange body. S - An interesting mix of tropical funk, a bit of earthiness, pine, and a definite hint of cat pee. Quite zesty and in-your-face, and as exactly as promised. Not a ton of malt character; guessing the brett gobbled most of the sugars. Alcohol is well hidden. T - The taste isn't quite as good. Starts fruit and sweet early, but finishes with some dirty brett, pine bitterness, and some lingering astringency and medicinal notes. M - Dry, medium body, pleasant moderate carbonation, light warming alcohol, and a pleasant, clean finish. Actually seems like a smaller beer than the listed 9%, but not in a bad way. D - Delivers exactly what the description promised, but I'm not entirely convinced by the concept. I think Brett C might have worked better, as it's the dirty and medicinal finish that really fails for me. Solidly executed, as you'd expect from Surly and 3 Floyds, and definitely the best brett beer I've had from the latter. Big fluffy fizzy fluffy soapy 2 finger head fades semi slowly with lots if messy lacing, mostly clear lemony yellow color. Nose super fruity peach and apricot like, some tropical fruit like hops with mango and little papaya, nice Brett funk with little pineapple and juicy fruit, pineapple eventually really ramps. Taste quite nice, big pineapple tropical fruit Brett and citrusy tropical hops, nice mild funk Brett, musty dank grapefruit pith and lemon rind, little grainy malt no real sweetness. Mild spicy bitterness, earthy hops. Long bitter hop finish, lots of pineapple and tropical fruit, earthy rind hops. Mouth is med bod, nice carb. T - Mangoes, lemon, light pine near the end. Light Orval-like brett and funk on the backend. 750 mL bottle poured into a snifter. Bottled 6/20/13. Appearance - Hazy orange. Big white head. Lasts quite a while. Thick collar. Smell - Stone fruits like peach. Brett, but not an earthy brett. Fruitier. Citrusy, but not too simcoe-y. Taste - Bright citrus here. Orange and then turns more grapefruity. Peachy. Grainy brett flavor. Not overly strong yet. A lot of pale malt as the hops and brett die down. Mouthfeel - Easy to drink, if a bit sweet. Medium carbonation. Overall - It's tasty. Be interesting to see how this develops. 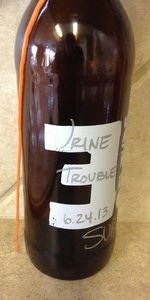 3 Floyds / Surly Urine Trouble from 3 Floyds Brewing Co.